The Ten 'Day' Of Christmas...! That last ten days of December to me have always felt like one lonnng day fading in and out of each other until the end of the year; the 'morning' (rising action) being the 21st to the 24th with a lot of running around and preparation activity, last minute closings, (with some necessary conflict for dramatic purposes) and year-end business wrap-ups--I am afterall, a morning person (see my Meme in a previous post); Christmas Day and the 26th (universally designated vacation day) being the pinnacle at 'high noon' (climax); and the next 5 days carrying on through the 'afternoon' and into the 'evening' with my mothers birthday on the 27th (dinner! ); and the 'day' finally ending with the proper (denouement) midnight ceremony on New Years Eve. Its a new day with a clean slate January 1st. (resolution) Get it? 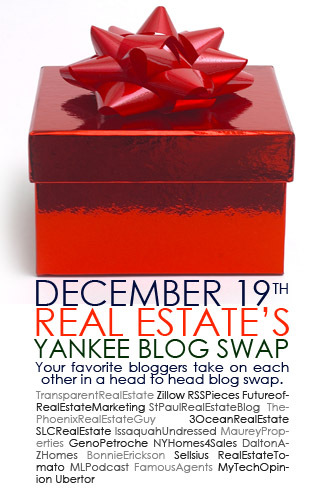 Thank you so much to Christine Forgione who brilliantly posted on my site yesterday and received critical acclaim as well in her 'landslide victory' in the first ever Real Estate Yankee Blog Swap. (hey, shame on me for being from Chicago and not being able to 'fix' a vote even if the reviewer... "can’t stand people with their hats turned backwards." Apparently he wasn't looking at who has my back! Feliz Navidad to all and to all a good life.